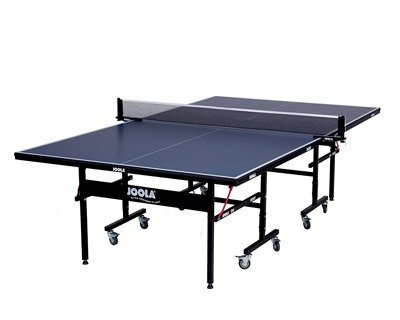 See where the Joola Inside ranks in our best table tennis tables list. The Joola Inside is a 15mm, inexpensive table tennis table that comes with a net and is very compact when folded. This makes it very easy and convenient to store or move. It is very easy to set up as it mostly comes pre-assembled and only requires to attach the legs. 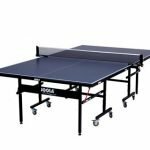 These features make it one of the best indoor tables to get if you want to enjoy a fun table tennis game with your loved ones. The Joola Inside is a great looking table that will blend beautifully with its surrounding area. It features a nice deep blue top that is complemented by a black iron apron and thick legs. It is very sturdy and stable and the top is made out of a 15mm wood composite surface. 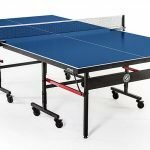 Although it is not the thickest table out there it still offers a consistent ball bounce and durability. The table sits firmly on strong caster legs with built-in stabilizers that will provide a lot of security even after years and years of usage. As the name says, it’s an indoor table and it has some features built specifically for this purpose. The table comes in two halves that are easily joined together in the middle. If this is a concern, you should be happy to know that because of the adjustable legs, the table top will be level no matter the surface it sits on. In the unlikely event that the halves do not match up, the clamp-on net will definitely do the job, as it is strong enough to correct any misalignments. Once assembled you will not be able to tell that there were ever two halves. Each half is equipped with four caster wheels that can be locked in place, increasing the table’s stability and safety both when playing as well as when moving it. At around 140 pounds the Joola Inside is a pretty heavy table. Keep this in mind on delivery day and ask a friend or family member to help you move the package into your play area. Once there the assembly is very simple. 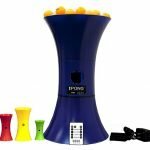 It comes mostly pre-assembled, so the only thing that you have to do is attach the legs with only 8 bolts and clamp on the net and you should be ready to start playing. It should take you about 20 min from opening the package until the first game starts. 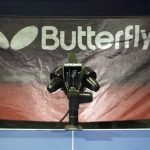 The table also comes with a net and post set that is very easy to setup and features an adjustable net tension system. This table offers a lot of performance considering the cost. 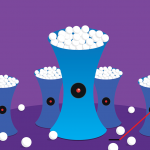 The ball will bounce evenly on any part of the table and it is grippy enough to react to whatever spin the ball may have. Some features worth mentioning include the corner protectors, the powdered undercarriage to prevent rust and playback action mode. This mode basically means that you can raise only one half and play by yourself. The legs can be folded so you can place the table against a wall to gain more space. This can be done in less than 30 seconds and is a great way to kill time when you have no adversary to play with. Once you are done playing, each half folds vertically and they are joined by a clamp for a more easy way of moving them together. By splitting the table in two separate halves it can each be stored in a different space or in a different configuration, giving you a lot of flexibility and maneuverability. In this folded position the dimensions of the table are as follows: 108 inches tall, 60 inches wide and 30 inches deep. This is compact enough to fit in almost any storage space. Seeing as this is an indoor table, it should never be used or stored outside. Exposing the table to high heat or humidity will result in the table warping, which will basically ruining it. So make sure your playing and storage area is relatively cool and dry. Serious players looking to improve their skills will find that the thickness of the table will not provide the necessary ball bounce and speed. This is to be expected as a club level table is 22mm thick but also costs around 2 to 3 times as much. Also, there are no paddles included with the table. So if you don’t already have one check out this guide. It will help you reach a decision much faster. 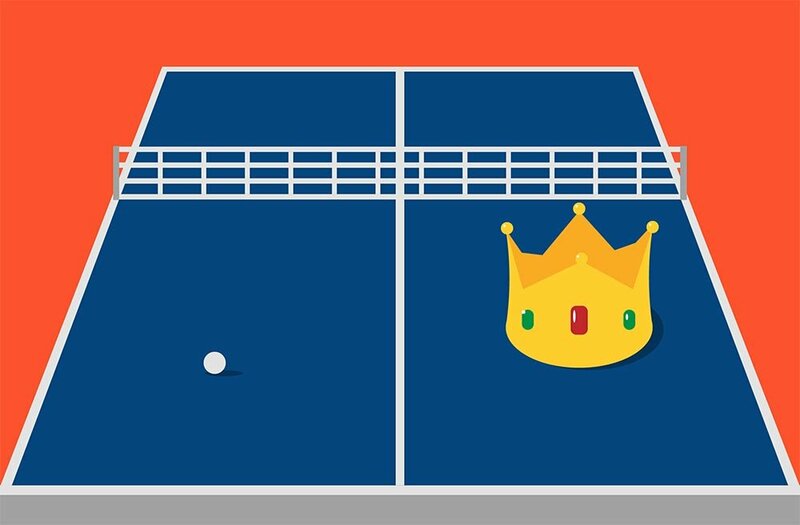 While the advanced player will want to look at a table with a thicker playing surface, the Joola Inside is more than enough for the recreational player. 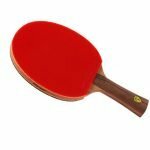 The 15mm composite wood table top gives the ball enough bounce and consistency to provide a satisfying and fun playing experience. 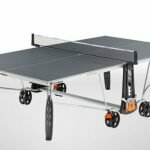 This is a solid ping pong table that is built to last and it will make for a great first table. 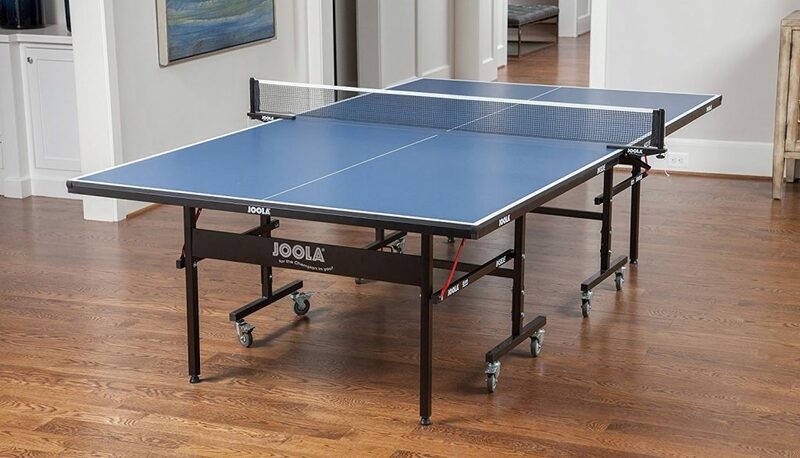 The quality of materials is very good and the attention to detail makes it hard to believe that this is considered an entry level table tennis table. It is very easy to assemble and store and comes at a very affordable price. It is the perfect table to get if you want to spend more quality time with your family or friends and burn some calories while at it. Still not convinced? Go over on Amazon to check what others are saying about the Joola Inside.